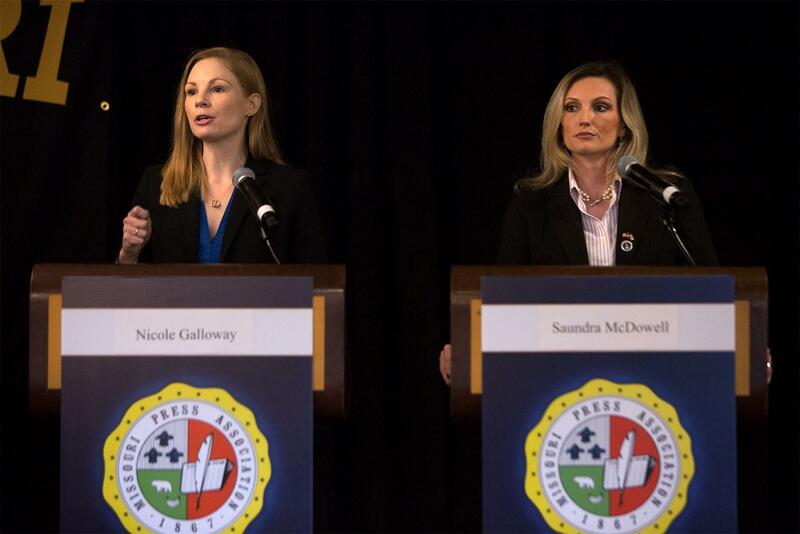 State Auditor Nicole Galloway, left, and her Republican challenger Saundra McDowell participated in a debate Friday. Democratic incumbent Nicole Galloway lobbed several jabs at Republican rival Saundra McDowell during the forum in Maryland Heights held by the Missouri Press Association. The candidates are competing in the Nov. 6 election. Galloway, an accountant, noted McDowell’s personal financial troubles and questioned whether McDowell meets the state requirement that she reside in the state 10 years before seeking the office. “She’s been sued seven times in the last five years over unpaid bills,’’ said Galloway, who also asserted that McDowell had embellished her record of investigating fraud while she worked in the state attorney general’s office. McDowell, who’s a lawyer, accused Galloway of failing to investigate some fraud allegations, of being late with audits and ignoring the state’s open-records laws. McDowell noted that the state GOP has sued Galloway for not turning over some office communications, including cell-phone texts. Galloway countered that state Attorney General Josh Hawley’s office has cleared her of any wrongdoing after examining her open-records practices. She also denied that her office was behind in conducting audits of local governments. McDowell and Galloway generally ignored the three other candidates on stage: Libertarian Sean O’Toole, Don Fitz of the Green Party and Jacob Luetkemeyer with the Constitution Party. The five contenders split when it comes to a proposed constitutional amendment, called Clean Missouri, that may be on the Nov. 6 ballot. A Cole County judge kicked the proposal off the ballot earlier Friday, but backers are appealing. The judge said the ballot proposal tackles too many topics. Among other things, the amendment would require the auditor to play a role in putting forth candidates for a demographer that will draw state House and Senate lines. McDowell blasted the amendment as unconstitutional and praised the judge’s decision. Galloway downplayed her support during the forum for the Clean Missouri proposal but accused McDowell of making inaccurate statements about it. O’Toole and Fitz said the initiative should be on the ballot because more than 300,000 Missourians signed petitions in favor of it. Luetkemeyer opposed the proposal, citing some of the judge’s objections.